I don’t think I’ve ever been this excited about a post. 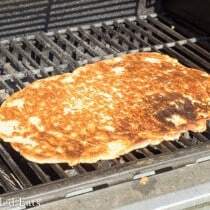 I started doing research about a week ago about how to grill a mozzarella based low carb bagel dog fathead pizza dough. And there was nothing on the internet. Nothing. 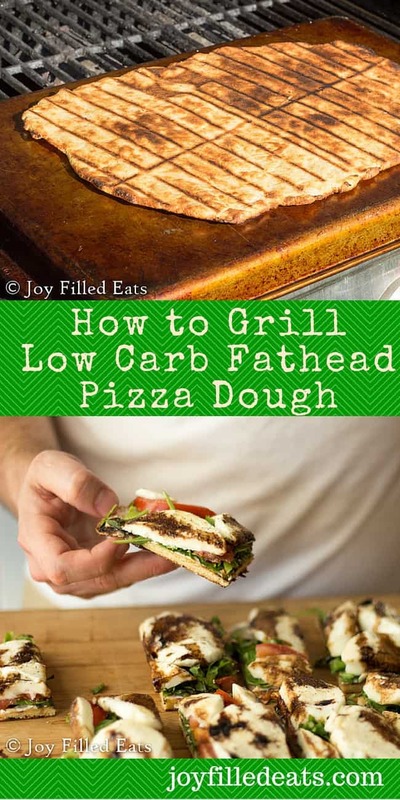 I asked in a few low carb and keto facebook groups and a few people said they tried it and it fell through the grates or oozed out the holes of their pizza pan. Call me crazy but I needed to try anyway. Mozzarella dough has been the savior to me when I was low carb and now on Trim Healthy Mama. It is so versatile I use it in both sweet and savory recipes. It works for bagels, breadsticks, pizza, sticky buns, cinnamon rolls, and danishes. I can’t begin to count how many times I’ve made it. 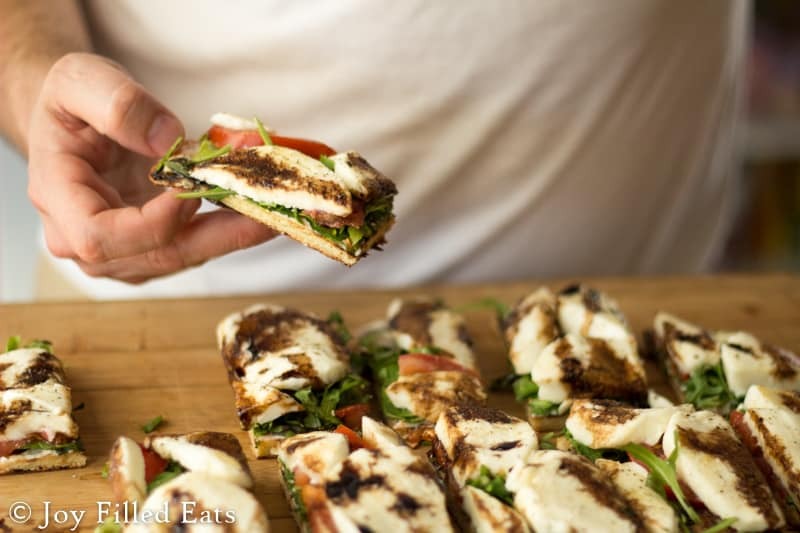 This will work with any variety of mozzarella dough. I came up with my own mainly because the original fathead dough uses just almond flour and almond flour gets expensive. I use a combination of almond flour, coconut flour, and ground golden flax to keep the cost down. Preheat grill to medium low. Put mozzarella cheese and cream cheese in a microwave safe bowl. Microwave one minute. Stir. Microwave 30 seconds. Stir. At this point all the cheese should be melted. Microwave 3o more seconds until uniform and gloopy (it should look like cheese fondue at this point, if it doesn’t keep microwaving in 30 second increments). Mix in the egg and baking mix. You will need to dump it onto wax paper and knead it by hand to thoroughly incorporate the ingredients or you can do this in a food processor with the dough blade. 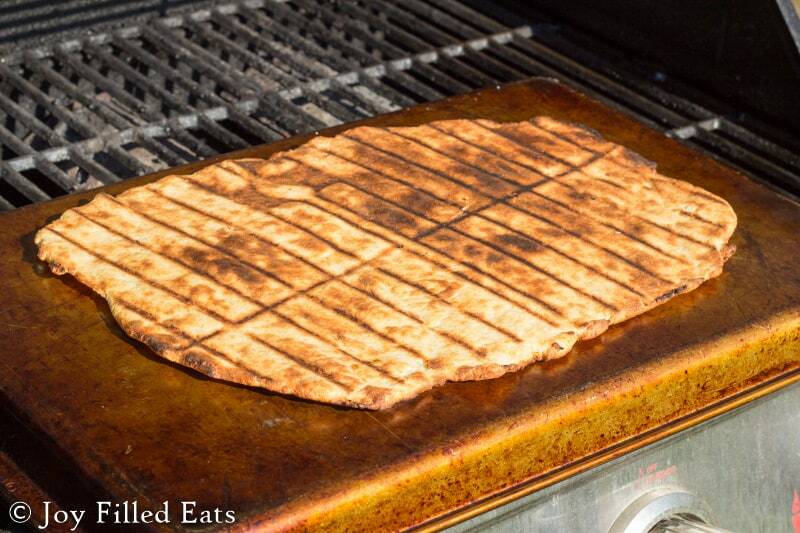 Line an old cookie sheet (make sure it will fit on your grill) with parchment paper. Dump the dough onto the parchment. Press or roll into a large circle using wet hands or a wet rolling pin. Put the cookie sheet on the grates. Grill for about 5-10 minutes until the dough has firmed up. The heat of grills varies a lot so it’s best to keep peeking at it every few minutes. Once the dough has firmed up and the edges are golden remove the baking sheet from the grill. Wear oven mitts, it is very hot. Flip the dough upside down right on the grates and peel off the parchment. If you want your toppings hot put them on now. Grill for an additional 5 minutes until the dough is fully cooked. For the gorgeous fresh mozzarella and arugula pizza in the photos I removed the dough before adding the toppings. The recipe for this is coming Tuesday so stay tuned! 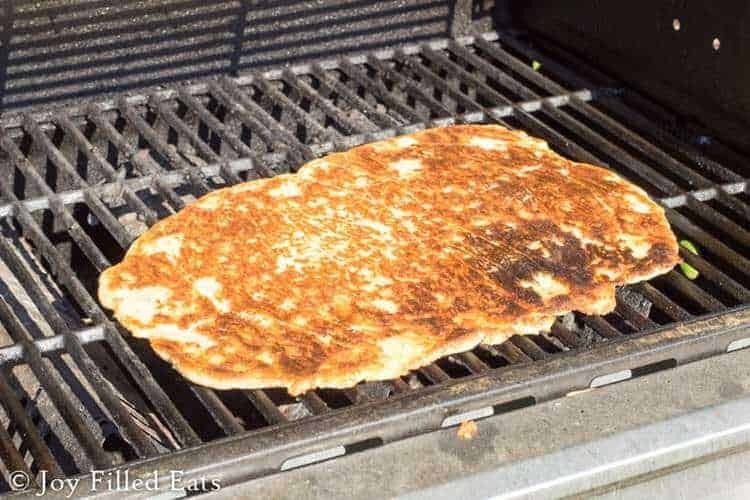 How to cook Low Carb Pizza Dough on your grill! Put mozzarella cheese and cream cheese in a microwave safe bowl. Microwave one minute. Stir. Microwave 30 seconds. Stir. At this point all the cheese should be melted. Microwave 3o more seconds until uniform and gloopy (it should look like cheese fondue at this point, if it doesn't keep microwaving in 30 second increments). Mix in the egg and baking mix. You will need to dump it onto wax paper and knead it by hand to thoroughly incorporate the ingredients or you can do this in a food processor with the dough blade. 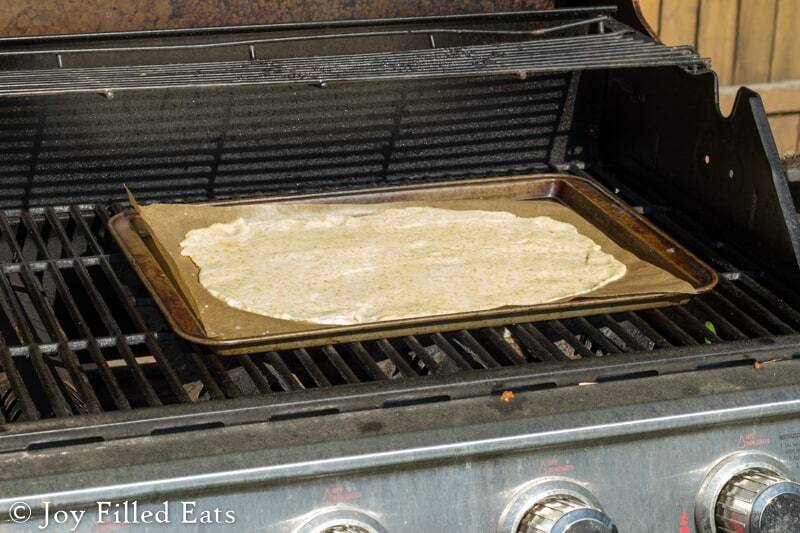 Line an old cookie sheet (make sure it will fit on your grill) with parchment paper. Dump the dough onto the parchment. Press or roll into a large circle on a pizza stone using wet hands or a wet rolling pin. Put the cookie sheet on the grates. Grill for about 5-10 minutes until the dough has firmed up. The heat of grills varies a lot so it's best to keep peeking at it every few minutes. Once the dough has firmed up and the edges are golden remove the baking sheet from the grill. Wear oven mitts, it is very hot. Flip the dough upside down right on the grates and peel off the parchment. If you want your toppings hot put them on now. Grill for an additional 5 minutes until the dough is fully cooked. Hi there, Thank you so much for this recipe - it was the second one I tried & it was delicious and totally fooled the husband. Do you have the nutritional info/macros for the dough? Thank you. Hi Stacy, I just added a nutrition label to the recipe. I'm glad you liked it! Do you think that can be cooked and frozen for future use? Mozzarella based dough freezes ok but not great. I have frozen it plain and then warmed it up and cut into triangles to scoop up dip (like a pita). Great instructions! Love the cheese dough pizza even better cooked this way. Thanks!! Sometimes. It depends on the filling. I will add a couple tablespoons of sweetener and 1 tsp of baking powder. Step 3 says put on cookie sheet....but then pizza stone. I'm confused. Why not skip cookie sheet and just use stone? Did I misread those instructions? Sorry, that is a typo. You begin grilling the dough on the cooking sheet or it will fall through the grates. I edited the instructions. Hi. I just found your recipe and it still notes the use of a pizza stone I have both. Which is best for this method? Thanks! I'm not sure a pizza stone could take the heat of the grill. I just use an old cookie sheet for this. Yes. I bake it at 400 for about 20 minutes.